Grilling is an international cooking method that has become very popular in India nowadays. So common is it that we see many bakeries and sandwich vendors replacing their tavas with grill pans! A grill pan is simple equipment, easily available in India at affordable prices. You get electric grill pans, as well as simple stove-top ones. The electric ones are more popular though. The best thing about grilling is that it is no rocket science and anybody can start grilling right away. Veggies, brushed with oil and seasoned with sea salt, herbs and spices, can be grilled to make delicious accompaniments. On the other hand, you can make more elaborate grilled foods like sandwiches, which are filling enough to be a meal. 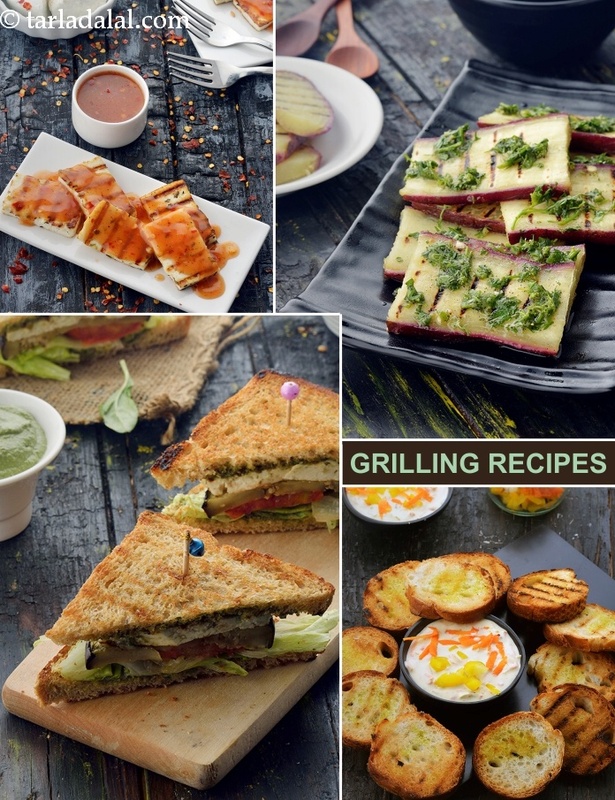 After a while, you will start inventing your own mouth-watering grilled foods! Since grilling involves applying dry heat to foods, it has two advantages – it cooks the food faster and also uses very little or no oil. At the same time, it also tends to boost the flavour of most foods, like eggplants or capsicum, making it super tasty. Grilled Zucchini, Grilled Cauliflower, Grilled Broccoli, Grilled Pumpkin, etc. are irresistibly tasty – they can be used in salads and other dishes, or served as accompaniments. You can perk up the grilled eggplant or other veggies with some toasted sesame seeds to make it even tastier, as in the case of Grilled Sesame Eggplant. Sea salt is a very effective seasoning for grilled foods and creates a burst of flavour on your palate, as you can see in the Grilled Baingan in Olive Oil and Sea Salt. A simple dressing, perhaps something lemony and herby, helps to convert a simple grilled food into an exotic starter, as is obvious in the Grilled Mushrooms in Garlic and Dill, and the Grilled Sweet Potato in Lemon Coriander Dressing, or the Grilled Paneer with Spicy Pepper Garlic Sauce. Grilled sandwiches, of course, have an evergreen appeal and you can make something extraordinary like the Grilled, Tomato, Eggplant and Paneer Sandwich instead of a plain cheese or veggie grilled sandwich. The cooking method also helps you create exotic Italian starters like the Grilled Crostini with Cream Cheese Dip. Once you get the hang of grilling, you will truly be spoilt for choice! There are so many, uncountable delicacies that you can cook, easily and quickly using your grill pan. You are in for a magical ride! 1. It uses less oil and is healthier than deep-frying. 2. Looks more attractive because of the appetizing lines the grill pan leaves on the food. 3. Grilling pans are available everywhere it is reasonably priced in India. 4. Grilled veggies can be used in salads or served as an accompaniment.